We designed the Supercharger network to enable a seamless, enjoyable road trip experience. Therefore, we understand that it can be frustrating to arrive at a station only to discover fully charged Tesla cars occupying all the spots. To create a better experience for all owners, we’re introducing a fleet-wide idle fee that aims to increase Supercharger availability. The Tesla app allows owners to remotely monitor their vehicle, alerting them when their charge is nearly complete and again once fully charged. 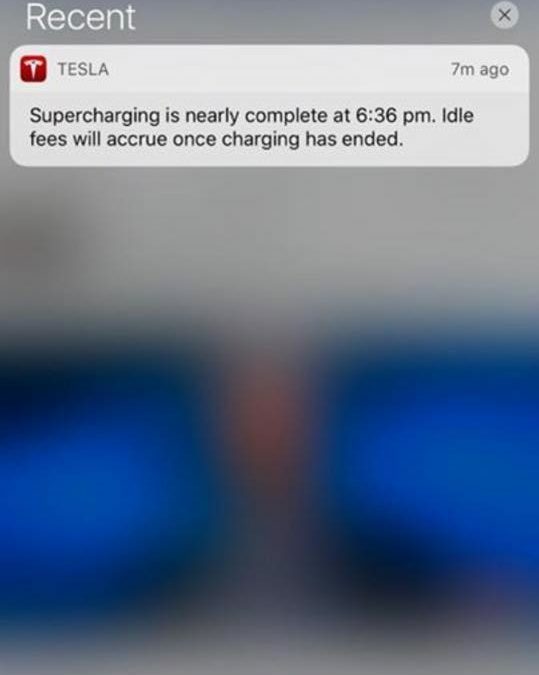 For every additional minute a car remains connected to the Supercharger, it will incur a $0.40 idle fee. If the car is moved within 5 minutes, the fee is waived. To be clear, this change is purely about increasing customer happiness and we hope to never make any money from it. 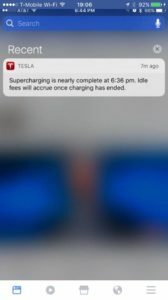 Within an hour, the change seemed to be in effect, as owners at Superchargers started sharing screenshots of notifications they received warning to move the car or face the fee. It will be interesting to gauge owner feedback to this change. While most will be in favor of something being done to deal with the problem of full Superchargers, this exact implementation may not be to everyone’s liking. For one, at Superchargers that have free spots, it could be burdensome to have to rush a meal/cut a walk short so as to get back to the car in time to avoid the fee. Also, I wonder if people can ‘game’ the system, even if simply out of spite. How will Tesla know you moved the car? Can you just drive forward and back it right back into the stall? Of course, such a move would be gutsy, considering there are likely other owners around watching/waiting for the spot. Or what if you do move the car, but to the next (non Supercharger) stall over, and Tesla’s system doesn’t register it as having moved far enough? While it seems like Tesla acted quickly (less than a week is impressive), could it be that this change had been in the works for a while, and Elon conveniently choose one of the many tweets on the matter to reply to when they were close to rolling it out? Regardless of how it all plays out, Tesla certainly has a knack for keeping things interesting.